Have you ever taken the time to imagine the history behind our Christmas traditions depicted on Nativity Christmas cards? Even though we are all familiar with the common nativity scene, the reality of Jesus’ birth embodies a subtly profound and deeply human story of survival. Mary and Joseph stand as the archetypical traveling young family trying to provide the best for their child on the most basic level. If you were to take the time to fully put yourself in their situation, you would feel the fear and desperation they overcame with courage and faith as they fled the persecution of misguided Herod. To add onto the already difficult circumstances, they were unable to find a place in a nearby inn and were forced to take refuge with the animals in a cave made to be a manger. Now this place was hardly suitable for childbirth by modern standards and Mary went through the entire ordeal with no doctors and no anesthesia, just her will. With this unpolished version of the Messiah’s birth in mind, all Christians can come to the solemn realization that Christmas is as much a celebration as it is a reminder of humility and conviction. So this Christmas season send your family and friends the same beautiful Christmas cards and gifts but keep in mind the humble origins of this beautiful tradition. On the site where Jesus was born a church was erected, the oldest one still holding services. It is called The Church of the Nativity in Bethlehem, founded in 327 by Saint Helena, the mother of Emperor Constantine I. The current Basilica of the Nativity was rebuilt in 565 by the Emperor Justinian I, after it was burnt down in Samaritan Revolt of 529. Here is an interesting fact, in 614 the Persians invaded Bethlehem but they did not destroy the basilica. According to legend, their hearts were softened by the portrayal of the Three Magi inside the church who were wearing traditional Persian clothes. They felt a deep connection to the place and were touched by the universality of the Christmas message. This can be considered one of the first Nativity Christmas cards, left by the builders of the church to display the message of hope and unity to future visitors and possible adversaries. To enter the Basilica one must first pass through the Door of Humility. The entrance is narrow and only 4 feet tall and 2 feet tall, forcing all who enter to bow their heads. Its construction also served a practical purpose, to prevent people from driving their carriages or horses inside the church. Today it is a solemn reminder for us to cast-off the material world with all its possessions and symbols of wealth to truly experience the wonder behind the Christmas season. Exactly at midnight on Christmas day a silver bell inside the Grotto sounds to the world that Jesus Christ was born as pilgrims from around the world gather on the Manger Square. 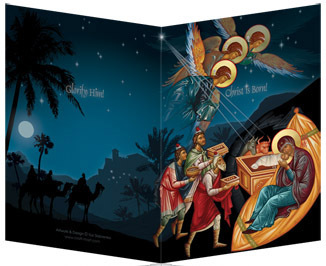 Though knowledgeable scholars argue which calendar is most accurate, Julian or Gregorian, the reality is that Christmas Eve services for the Eastern and Western confessions in Bethlehem will be held on different days: the Roman Catholic Church will celebrate the Nativity on December 25 while the Orthodox Church will celebrate the birth of Jesus on January 7. You will hear ‘Christ is Born! Glorify Him!’ in many different languages: Hebrew, Arabic, Greek, Russian, Romanian, Italian, French, English … as on inscription inside Nativity Christmas cards. The crowd in the Manger Square sing carols, enjoy the glitter of lights, illuminated crosses and a variety of Nativity Christmas gifts for sale offered by numerous merchants while the crowded faithful inside the grotto on their knees will kiss the silver star with humility and new understanding the birth of Jesus brought to the world. 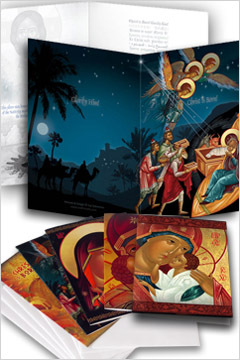 You may purchase several Customizable Nativity Christmas cards by following this link.